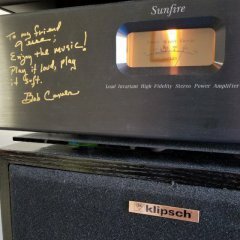 After over a decade of great service, the KSW-15's amp finally died. Support said they don't carry them anymore. I'm looking at the R-115SW. I loved the sound and power of the KSW-15. I listen to more music than watching movies. I keep seeing a lot of talk about the R-115SW being too BOOMY. I never thought the KSW-15 was too BOOMY. Anyone with direct experience with both of them? I saw people talking about that on another forum, but they said the woofer is 16 ohms, and they couldn't find an amp for that. If I have to get a new woofer, a new amp, and possibly mod the box, I'd just as soon go with something new. I'll take a look on parts express though. Thank you! I went down to NFM and listened to the SVS PB-2000, 4000, and the R-115SW. The PB-2000 was no where close to filling the room like the R-115SW. The 4000 had more low end oomph for sure, but at $2K, it was way more than I wanted to spend. I went with the R-115SW, and it sounds great. It seems to crush the KSW-15 in every way I can hear. I can hear notes in bass lines with it that the KSW-15 muddled. So far so good! What mains were you running with the SW15? ALSO, if you DON'T opt to repair your SW-15 through repair or replacement of its plate amp, please PM me with how much you will sell it for and City, State you are in...thanks!